This series features four projects that go together to make a three ring circus, along with other crafts and digital papers with a circus theme. Each project offers a variety of patterns that vary in size or design or both. Suggestions are made about additional ways to decorate your crafts and to make them truly unique. Some of the suggestions refer the crafter to the Decorative Craft series of projects for ideas and techniques. The projects range in difficulty from EASY to AVERAGE. Browse down this page for descriptions and illustrations of the projects, then select a project and have some crafting fun! 3D Paper Circus Trapeze Act - In this project, you will make circus trapeze performers and a trapeze. The craft includes printable patterns for four trapeze artists and instructions for making a lightweight trapeze suitable for hard or carpet surfaces. This is the fourth of four craft projects for the Under the Big Top craft series. 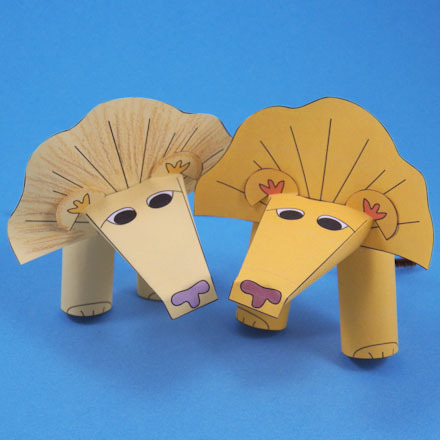 3D Paper Circus Lion and Lion Tamer - In this project, you will make a circus lion and circus lion tamer. The craft includes printable patterns for two sizes of lions and male and female lion tamers. Make up all the patterns for a complete circus lion act! This is the third of four craft projects for the Under the Big Top craft series. 3D Paper Circus Ringmaster - In this project, you will make a circus ringmaster and a circus ring. The ringmaster introduces all the circus acts and does the stage-direction for the circus. Make a ringmaster (or two) for your paper circus and a circus ring for each circus act. This is the second of four craft projects for the Under the Big Top craft series. 3D Paper Circus Seal - In this project, make a circus seal and things to go with it. You will make a drum stand for it to lean on during its performance, along with juggling rings and a ball for its juggling act. This is the first of four craft projects for the Under the Big Top craft series. Finger Puppets - In this project, make four different finger puppets with a circus theme: acrobat, strongman, clown, and elephant. 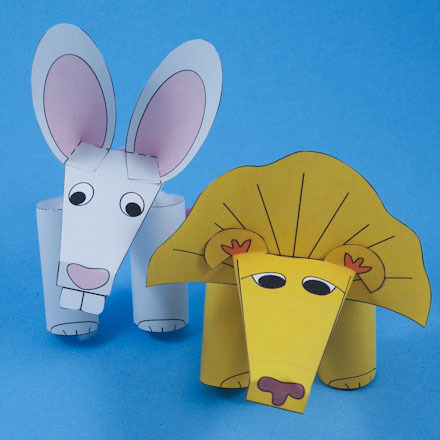 The puppets in this project are very simple—just print, color, cut and glue. They can be made with paper or cardstock. Heart Shaped Cards - Make simple and fun Valentine cards in the shape of a heart or with a heart-shaped top. Most of the cards have a circus theme and one is especially designed for giving to your sweetheart. Sheet of Six Valentines - Full sheet of six easy to make circus seal valentines - cut, fold, glue. Also available as a printable ready to color. For more details on making these Valentines, see Simple Valentines. Sheet of Nine Valentines - Full sheet of nine easy to make circus seal and strongman valentines. These Valentines are designed for cardstock, printed front and back. Just cut! Also available as a printable ready to color. For more details on making these Valentines, see Simple Valentines. All Aunt Annie's Crafts ePapers are full page designs that fill an 8.5" by 11" sheet of paper. In Adobe Reader print with no Page Scaling to maintain the original design aspect ratio. When printing to A4 paper this results in the design not quite filling the length of the page. Circus Diamond and Arrow Paper - Use this printable digital paper to decorate accessories for the crafts in the Under the Big Top series, in handmade greeting cards, or any paper craft. This ePaper coordinates with the Circus Paper Ribbons digital download. Circus Paper Ribbon ePaper - Use this printable digital paper to make circus rings for the crafts in the Under the Big Top series, in handmade greeting cards, or any paper craft. Stars on Red and Blue ePapers - Use these White Stars on Red, White Stars on Blue and Yellow Stars on Red ePapers to make accessories for the crafts in the Under the Big Top series, in scrapbooking or other crafts. Yellow, Orange and Blue Diamonds ePapers - The YOB Diamonds, YOB Diamonds with Arrows and Blue Diamonds on YOB Diamonds ePapers are inspired by the circus-themes in the Under the Big Top craft series. The digital papers can be used to make circus accessories, handmade greeting cards or the Half-moon Petal Envelope. Harlequin Diamonds ePapers - The Pink Harlequin Diamonds, Orange Harlequin Diamonds and Multi-color Harlequin Diamonds ePapers coordinate with the boxes in the Diamond Box project. Puppets: Many of Aunt Annie's puppet crafts use 3D paper-shaping techniques and go well with the 3D Circus. These include: Finger Puppets , Three-Finger Puppets, Two-Finger Puppets, and Paper Cone Finger Puppets.